First, one has to obtain a visa permit from the Foreign Ministry (FM). This is the only ‘authority’ with the power to issue Iranian visas. It is a centralised process, thus all applications must be approved solely by visa section of FM. Once the visa application is approved, a visa permit number will be issued for you. This process can take around four weeks. The second part is to visit an Iranian Consulate (appointed at the start of the process) armed with the visa permit number, in order to have the visa stamped in the passport. This cannot be done by post and can take anything from one working day to two weeks. A. Ask your Iranian host company to lodge an application at the Foreign Ministry (in Tehran) on your behalf (in the capacity of your host) and obtain a visa permit. Please note an ‘invitation letter’ from your host company is not sufficient. B. We can obtain a work visa permit on your behalf, as long as you can provide details (name, telephone number and address) of a business contact in Iran. Once you have the visa permit issued via your host company or ourselves, we can also assist you to have the visa stamped into your passport. You are then ready to travel to Iran. UK passport holders do not have the option of getting a ‘visa on arrival’ – they are required to have the visa stamped in their passport in advance. You can request your visa permit to be sent for collection at the Iranian Consulate in London. UK passport holders are required to provide fingerprints in order to collect the visa stamp. The Iranian Consulate in London (50 Kensington Court London W8 5DD) is open on Mondays Wednesdays & Fridays from 2 pm to 4 pm for finger printing. Thankfully fingerprints are required only on the occasion of the first visit & subsequently not needed, as the consulate retain the records. Please note if your visit takes place more than one year following the previous one, you would need to provide fingerprints again. UK passport holders are usually required to collect their visa stamp at the Iranian Consulate in London. So the option of visa collection for example in Dublin, Paris, Istanbul or any other city, is not easy to arrange. Once the visa permit is issued, it is valid for collection within one month. Once you have it stamped into your passport, you have three months to enter Iran. 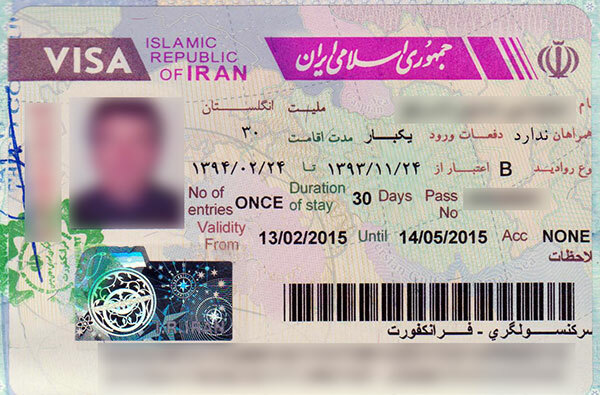 The visa duration is for a maximum of 30 days stay in Iran. The first step in the process is to lodge an application with the visa section. In order to do this, please print & complete in black ink, this form: “UK Business Visa Through Iranian Host“. Please check an example of an already completed form here. You also require a clear color scan of the photo page of your passport. The time frame for the visa permit to be approved by the FM is up to 25 working days. There are a great deal of public holidays in Iran which can delay the process. Please check public holidays in Iran list of Iranian holidays. Once the visa permit is issued, the FM staff will email your hosts to advise them. Your hosts can then forward the visa permit number to you. You are now in a position to have the visa stamped into your passport. We can assist you at this point. You will need two standard passport photos with a white background. In order to use our courier service, once we discuss and agree the time frame, we will ask you to send by ‘signed for’ next day post, or deliver in person, your passport, two photos & completed visa application form, to our couriers who will handle getting the visa stamped into your passport. We will ask you to include a cover letter (this will be sent to you separately) to state Magic Carpet Travel Ltd, requested that you send your listed documents. You will be asked to include your visa permit number & a contact number. The cost of our courier service is £350 (plus VAT) per passport, for which our courier will take your passport to the Iranian Consulate to get the visa stamped in. We will make an appointment during the week at 2 pm for you to come in and meet our representative, who will assist you with the process of providing your finger prints. This will take about one hour. Then depending on the service you have requested, we will either arrange for your stamped passport to be returned to you, anything from ‘the next working day’, and up to ten working days. The cost excludes visa stamp fees, which varies according to nationality. Currently (Jan. 2019) the ‘work visa’ stamp fees for UK passports is £220. We accept payment by bank transfer or Credit /Debit cards. You can find full details on Payment. Within our ‘standard service’ it takes around two weeks from the time we receive your passport and documents to have the visa stamped into your passport. We also offer an Express Service – where we guarantee to return your stamped passport within 2 – 5 working days of the receipt of your documents. There is a surcharge of 50% for this service. Should you require your passport to be stamped in the same working day, we are pleased to do so, on a case by case basis. Please contact us for further details.